Imagine what it’s like to be able to remember everything. We’re not talking about a good memory, but an extraordinarily detailed ability to “re-watch” something that happened yesterday, a week ago, or even twenty years ago. Oh and the bad stuff that we are able to let fade is just as vivid. 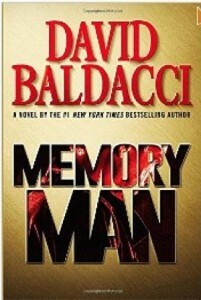 In David Baldacci’s novel, Memory Man , former detective Amos Decker has this unique ability and is faced with trying to solved a series of crimes that become very personal. I think this was my first time reading a novel by Mr. Baldacci. It was an interesting story that kept moving and had some interesting moments. The end left me a bit wanting regarding all of the connections. If I say more then I give too much away. Sorry. The author sets up the narrative for a long crime-fighting series. This article was published on May 9, 2015 . It is tagged Amos decker, David baldacci, Memory man. You can follow any responses to this article through the comment RSS feed.